Simply, you will be astonished how much they cost to run, as I was when I started to work out the costs. There’s a bit of math involved, but you can easily do it on a calculator or a phone app. I typically buy one bag or two bags of coffee from Starbucks (or the equivalent); so I’ll use that as an example for this post. Now when I make coffee, I tend to use a lot more coffee than average; I’ll use about 15g per cup of water. That means that on average, I will be able to make 30 cups in a bag; granted I make several cups at a time for family or friends. In other words, that’s costing me $0.40c per cup for 7-8oz serving of black coffee. And it is nicely made, better than you’ll ever get in-store. You could of course choose to make your coffee with about 10~12g of coffee grounds. Many people do. Other reasons I like to make my own: I can choose whatever coffee I like to put in my coffee maker; and I can grind it how I like for better flavor. Starbucks prices @ Amazon are a little higher it seems. But don’t be seduced by the Starbucks capsules for Keurig. So if I want to make 30~45 cups of coffee, I’d be looking to purchase a pack of pods: Nespresso Full and Balanced Roma Capsules, 30 Count. Currently that runs to $29.95 on Amazon. The other choice is to buy a 50 pack of capsules with a price point around $40.99. It’s clear that Nespresso have mastered the art of buying, packaging, and selling overpriced coffee in an attractive and convenient package. It’s also clear that Nespresso coffee isn’t cheap. I’m not taking aim at Nespresso particularly, but all one cup coffee makers pretend that they are ‘cheaper’ because you don’t throw away unused coffee. At 10g per cup, I could make 45 cups of coffee from Starbucks beans, then I could make another 45 cups on a second bag and throw the whole lot away. I would still have change to buy another bag of coffee after that; and I could then use the remaining $5 to buy a trenta iced coffee, not forgetting a $1 tip for the barista. 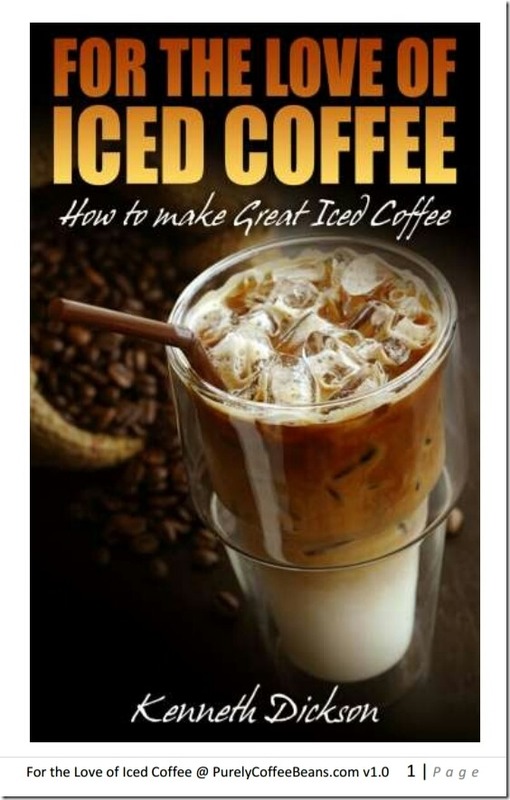 At 15g per cup, I could make 30 cups per bag, then I could still buy one more bag to make 30 more cups of strong coffee; and buy a decent iced coffee (with a tip). Do your own math! Decide if you want to substitute stale/expensive/limited choice/small-sized cup of coffee for a mug of freshly ground coffee/$29/a few minutes of your time/a little rinsing! I know which I’d choose. *note I use 450g as functionally equivalent to 1lb. Most capsule weights are given in grams. If you have to weigh the coffee capsule yourself, use the dry coffee (not after it’s used). Nespresso is 5g; other systems may have as much as 7g. For example: ( 450 / 5g ) = 90 capsules x $0.80 per capsule = $72.00 per pound of coffee equivalent. Don’t let the flashy one cup coffee maker sales teams dictate your coffee! BTW, when I checked the sample used in the New York Times article, I noted that the capsules were considerably more expensive on Amazon. 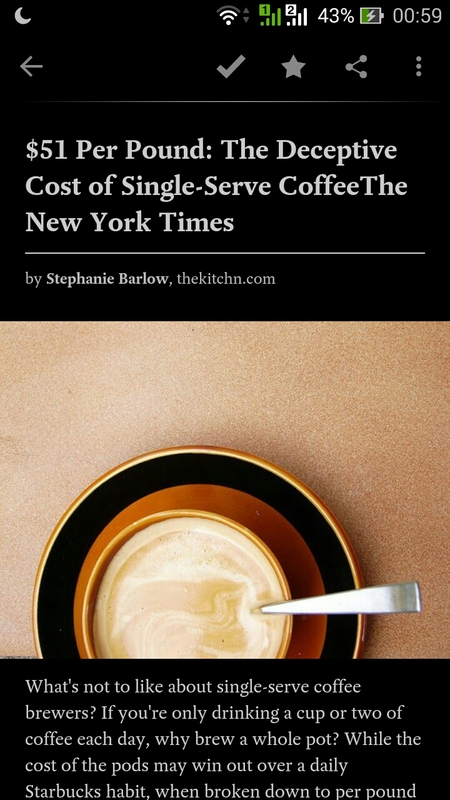 $51 Per Pound: The Deceptive Cost of Single-Serve Coffee — The New York Times | The Kitchn.